My name is Bui Hoang Nguyen and I’m from Hanoi in Vietnam. The first time I saw my older brother doing flair bartending, I thought that’s what I want to do for a job. So I actually began my career flair bartending, but now I am more interested in mixology and classic bartending as I really like working with various flavours. 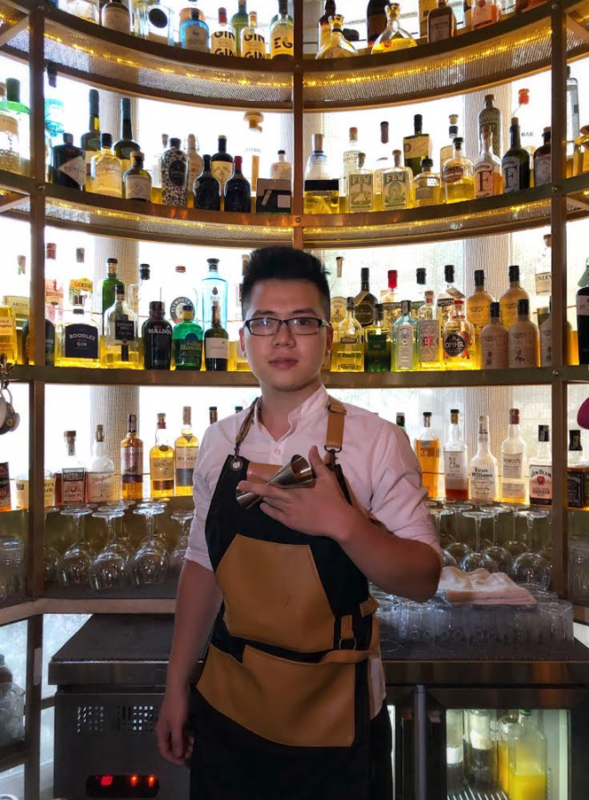 I began my career in Hanoi at the Rooftop Bar, then Camelia Lounge before starting here at the Mad Botanist as head bartender, which has been my role for the last two years. I came here because I love gin and we are a gin bar. Even though we are focusing on gin, (we have more than a hundred different types) we work with other spirits too and change the menu twice a year, regarding the season and available produce. My dream bar would be a small speakeasy in Saigon, focussing on service with room for no more than eight customers at once. The interior would feature pictures of botanicals and the music would be old jazz. I’d also like to have a short cocktail menu that changed monthly. I read cocktail books like Liquid Intelligence from Booker & Dax when I have spare time. At night I go to bars like Ne Cocktail Bar and Polite & Co. I like gin because it’s flavour profile is very colourful and it makes a drink special. I really like Nordes for instance, (which is a Spanish gin) because of its particular smell and taste. I think the way it looks is important, and the attitude of the bartender too. After that it’s about fresh ingredients, so you can make homemade preparations. I enjoy using botanicals to infuse with my gin. You need to go to Atlas for their gin collection and Manhattan Bar in Singapore.